George Everly Jr., Ph.D., a pioneer in the field of psychological trauma and disaster mental health, shares his thoughts about why now, more than ever, we need people who can attend to the emotional injuries suffered at the disaster scene. When a natural or man-made disaster strikes, first responders must also tend to the victims’ mental health needs. But there are not nearly enough people who are well-trained to de-escalate acute psychological distress in an emergency situation. Q: We’re used to survivors of disasters who have experienced unthinkable stress receiving material assistance like first aid, food and emergency shelter. 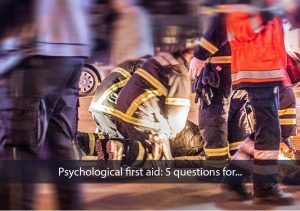 What is psychological first aid? A: Psychological first aid (PFA) may be thought of as the psychological equivalent of physical first aid. It’s not counseling, and it’s not a substitute for counseling. It’s a form of psychological crisis intervention, short-term support that is meant to mitigate acute distress and facilitate access to continued care as needed. PFA is a bit different from physical first aid like that provided by the Red Cross, for example. PFA consists of an initial contact usually at the scene of the incident and then one or two follow up contacts, if possible. Q: Given the wave of both natural and man-made disasters, it seems there’s a greater need for psychological first aid. A: It has been estimated that about 25 percent of those directly affected by events—such as crisis situations, disasters and even terrorism—could be in need of psychological first aid. I have seen this surge in demand first hand from my experiences spanning almost 40 years. But it’s important to emphasize that psychological first aid is also applicable in any crisis situation where psychological support would be useful. In fact, Psychological first aid has been recommended or endorsed by the World Health Organization, the Institute of Medicine, the National Institute of Mental Health, the American Red Cross, the International Red Crescent, the American Psychological Association, the Federal Emergency Management Agency, and the American Psychiatric Association. Such a rare unanimity of opinion supports the perceived need for this intervention. Q: How is PFA practiced, and who would deliver it at a disaster site like the recent ones in Puerto Rico and Houston? A: PFA is delivered in the field, in shelters, and in health care facilities…wherever there is a need for psychological support. It’s similar to physical first aid, so it can be delivered by any appropriately trained adult; anyone who responds to crisis. So, this would include first responders, public health personnel, emergency services personnel, communications personnel, disaster workers, nurses, mental health clinicians, corrections professionals, EAP counselors, educators, physicians, security personnel, attorneys, and clergy. Q: What is the RAPID model of psychological first aid? A: Here at Johns Hopkins we have developed a model of psychological first aid, which we refer to as RAPID (Reflective Listening, Assessment, Prioritization, Intervention, and Disposition). This is a research-based intervention specifically designed to address the needs of individuals in acute distress, while at the same time enhancing community resilience by utilizing local and neighboring community provider resources to address the surge in demand for psychological support. In our workshops, we train a wide range of health care professionals and lay people to provide psychological first aid. Q: We can see the outcome of a victim whose external injuries have been patched up on the scene by a first responder; how do we know the outcome of someone treated by a PFA responder? A: It’s obviously far more difficult to see the effects of a PFA intervention than a material intervention. That said, we would hope to see lower prevalence of depression, anxiety, post-traumatic stress disorder, and psychiatrically related hospital admissions. And research suggests that PFA programs enhance perceptions of personal resilience by fostering a sense of self-efficacy in individuals and it seems to enhance community resilience by fostering a sense of connectedness and interpersonal support. Mark your calendar for the 2-day Johns Hopkins RAPID Psychological First Aid Workshop, on March 15-16, 2018, in Baltimore, MD. Dr. Everly will lead the research-based training workshop that will teach health care professionals and lay people how to effectively respond to disaster site victims who are experiencing psychological trauma. He is the co-author of The Johns Hopkins Guide to Psychological First Aid (Johns Hopkins University Press, 2017).